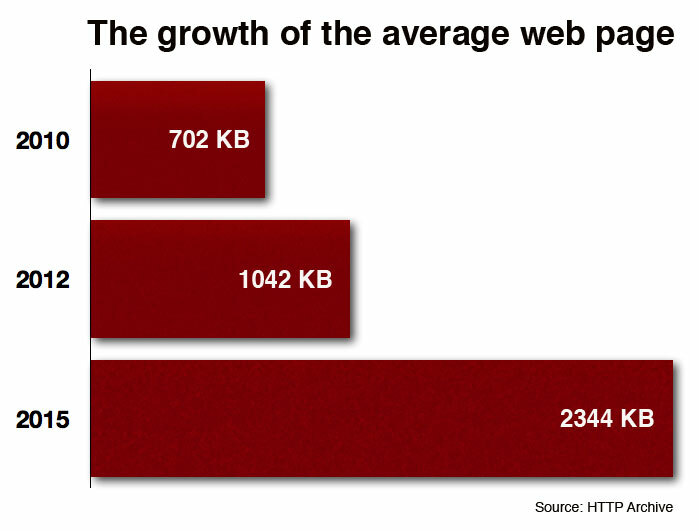 The average web page is now more than 1 megabyte (MB). This isn’t a case where bigger is better, it’s bad for site owners and for mobile users. 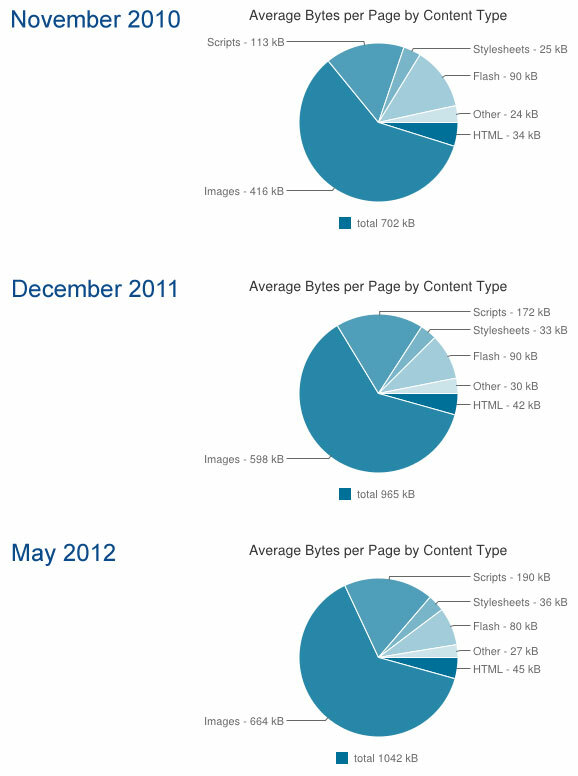 Back in December, I predicted that at some point in 2012 the average web page would surpass 1 MB in size. That point has arrived — a little earlier than even I expected. On May 1, the newest web page stats released by the HTTP Archive revealed that the average web page is now a whopping 1042 kilobytes (1024 kilobytes equals a megabyte). What’s behind rampant page bloat? To put things in perspective: at the time I made my prediction, the average page was 965 KB. That’s 8 percent growth in just four months. Doesn’t sound like much? Then consider this: Back when the HTTP Archive started tracking page stats in November 2010, a mere 18 months ago, the average page was an already hefty 702 KB. Pages today are almost 50 percent bigger than that. If pages continue to grow at this rate, the average page will hit 2 MB by 2015. The main culprits for this growth are images (which account for more than half of the average page size) and third-party scripts like analytics, ads, and social sharing buttons. But what’s really behind it is our insatiable desire for richer, more dynamic content — coupled with site owners’ desire to track user behavior and get us to share their content using every conceivable widget. Mobile users are the biggest losers. 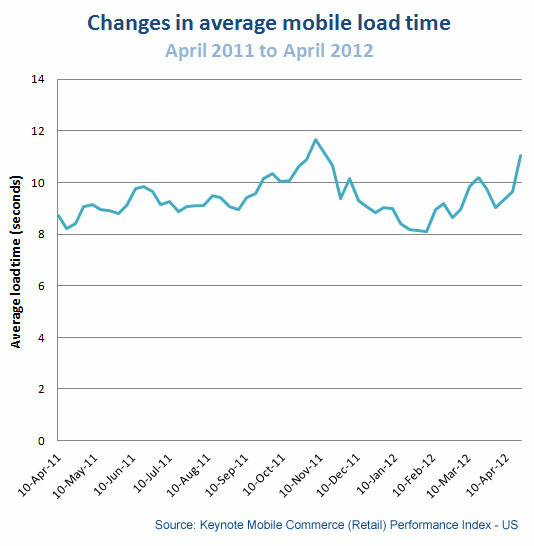 While bigger pages hurt performance for desktop users, too, the biggest victims of page bloat are mobile users. Not only does a 1 MB page take forever to load, it can also deliver a nasty case of sticker shock when you get your phone bill. To give you a for-instance, earlier this month I was traveling in Europe. Before I left home, I bought 25 MB of data from my provider for $100. In other words, I’m paying $4 per page. And if your service provider doesn’t hit you with a huge bill, they’ll hit you with a data cap and throttle your service. A 2 GB data plan sounds like a lot, but if you watch videos, listen to music, and download ebooks, it doesn’t get you very far. (Consider that 1 MB equals about 20 seconds of medium-quality video or 45 seconds of music.) The proliferation of 1 MB pages will catapult you to your data cap that much sooner. But this doesn’t only cost mobile users. Bloated pages cost site owners too. Bigger pages inevitably take longer to load. There’s a huge body of research that shows that when people visit slow sites, they spend less, view fewer pages, click fewer ads, and spend less time on site. This applies both to mega-sites like Amazon (s amzn) (which famously announced that for every 100 milliseconds of slowdown, they experienced a 1 percent drop in revenue) and smaller “mortal” e-commerce sites like auto parts vendor AutoAnything (which found that by cutting page load time in half, it grew revenue by 13 percent). How much bigger can pages get? Like it or not, this kind of growth is the norm, and it’s going to continue to be a problem for users. Sure, today’s devices, browsers, and networks are incredibly powerful compared to the clunkers of 15 years ago, but here’s the problem with our great big juicy hominid brains: you can pretty much count on the fact that if you have a team of technology geniuses in room A working to fix one problem, there will be a team of equally brilliant people in room B developing a technology that will create a new problem. So while devices, browsers, etc. are always getting better, we’re also developing more and more bandwidth-hogging content. At best, the two factions are neck and neck. Where this will take us is anyone’s guess. Joshua Bixby is president of Strangeloop Networks, a company that provides website acceleration. Bixby also maintains the blog Web Performance Today. He can be found @joshuabixby on Twitter. Umm, any website worth its salt has a mobile optimized page that is usually leaner than their normal page. Has the author ever surfed the web with a mobile phone? So when you work out what the average page size is, you only count sites that are optimized for mobile? Makes perfect sense, but in reality the websites that are “worth its salt” right now are the exception to the rule. I was thinking exactly the same thing. It’s a short-sighted argument otherwise. The ‘page load times’ data is pretty inconclusive too. What about the effect of the number of http requests rather than file size? Badly coded pages and poor infrastructure will mean it takes ages to load pages in some cases even when file size is modest. The overwhelming majority of bits or bytes spent on scripting are (a) put there — however naively or unknowingly — by the site owner, himself, and (b) put there with the express purpose of facilitating relatively benign background tasks: the big three of which are advertising, active content service [ie: CMS] or the many flavors of SEO, including site-navigation. Yet all of that pales in comparison with the threat now posed by maybe half the blogs I visit: loading the site’s mainpage brings you the contents of dozens or even hundreds of posts, all at once…many if not all with embedded images or flash video players. It’s bad enough to trigger such a digital landslide from a desktop, but on a mobile it’s nightmarish. 1220 lines and 93 scripts to deliver the 680 words worth of content and 4 comments I’m interested in on this page. Yep, it’s out of control. The irony of running this article on our particularly overladen pages is not lost on us. The popularity of CMS’ such as WordPress most certainly add to the issue of large page sizes. Obviously, those tools are not inherently bad, but the ability to easily add all sorts of rich media combined with a ton of extra scripts leads to some morbidly obese pages. I’m going to have to call out Mashable on this.. it takes so long to load one of its pages and then it almost feels like it slows my entire browser down if I have one of their pages open in a tab but not in others.. WTF? Timely post – indeed the speed gained from faster networks is lost to heavier pages. Time for a movement for leaner/meaner web, alternatively, apps could offer a leaner/meaner experience at the cost of having to download a plethora of apps and worse, lose out on the wonderful ability to “link” content across sites so simply. Thank you for giving this issue attention. No matter how fast my 4G connection is, the only time I ever see fast page loads are on TV commercials. All of the 3rd party garbage makes the connection mostly useless.